Stainless Steel Coating | Stops Rust & Corrosion Permanently | Superior Industries, Inc.
A super tough, long lasting coating containing pure stainless steel in an ultra durable resin system. Seals, beautifies and protects metal, wood, ceramic and more. 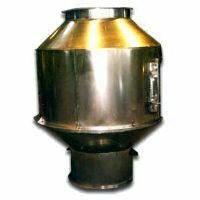 Helps prevent deterioration caused by harsh chemicals, severe atmospheres or conditions. Tack free in five minutes, hard cure in two hours. 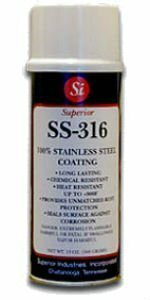 The finest stainless steel coating available, SS-316 is sure to meet your rust proof coating and corrosion proof coating needs. 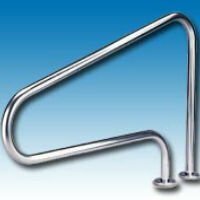 This stainless steel coating actually applies a stainless steel finish to most surfaces including steel, aluminum, ceramics, cast iron, plastics, wood and even stainless steel. This stainless steel paint product is packaged in convenient to use aerosol cans as well as 5 gallon and 55 gallon containers. The product contains a pure stainless pigment which offers the highest resistance to harsh chemicals and most acids. SS-316 is rated the highest in corrosion proof coating for salt spray resistance. In addition, this stainless steel paint coating can be exposed to high temperatures up to 400°F (204°C). Even in high temperature conditions, this products resistance to chemical exposure is not degraded. The curing time is approximately 2 hours. SS-316 exhibits a brilliant metallic appearance and in sunlight the stainless steel pigment can be easily seen. 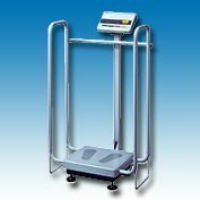 In addition to its chemical and acid resistance, SS-316 can be easily cleaned using a suitable detergent and can also be pressure washed when needed. SS-316 is the coating of choice for industrial, commercial and marine equipment where salt spray and harsh chemical exposure will harm most coatings. When the ultimate in rust proof coating and corrosion proof coating protection is needed, our pure zinc coating can be used as a primer and SS-316 for the top coat. SS-316 in conjunction with pure zinc coating will provide the highest degree of chemical and corrosion resistance that can be achieved. The coupling of these products will provide long term protection against rust and corrosion while offering an outstanding appearance. The stainless steel paint coating SS-316 has excellent resistance to chipping or flaking. The surface should be thoroughly cleaned prior to application of stainless steel coating. To insure proper adhesion, a 60 to 100 grit sanding disc can be used to create an acceptable profile. This procedure will prevent chipping or flaking and provide long term application success. Each coat of SS-316 will apply approximately 3 mils of thickness. One coat is acceptable, however, two coats are recommended and provide the optimum results.